Genu Valgum is also known as knock knee. In the valgum deformity, the knees are tilted toward the midline i.e Legs curve inwardly so that the knees are closer together than normal. It can result from injury or septic destruction of the lateral half of the lower femoral epiphyseal plate, results in arrested growth of the lateral condyle of the femur. The continued growth of the medial condyle results in unilateral knock knees.The typical gait pattern is circumduction, requiring that the individual swing each leg outward while walking in order to take a step without striking the planted limb with the moving limb. Not only are the mechanics of gait compromised but also, with significant angular deformity, anterior and medial knee pain are common. These symptoms reflect the pathologic strain on the knee and its patellofemoral extensor mechanism. The degree of knock knee is measured by the distance between the medial malleoli at the ankle when the child lies down with the knees touching each other. 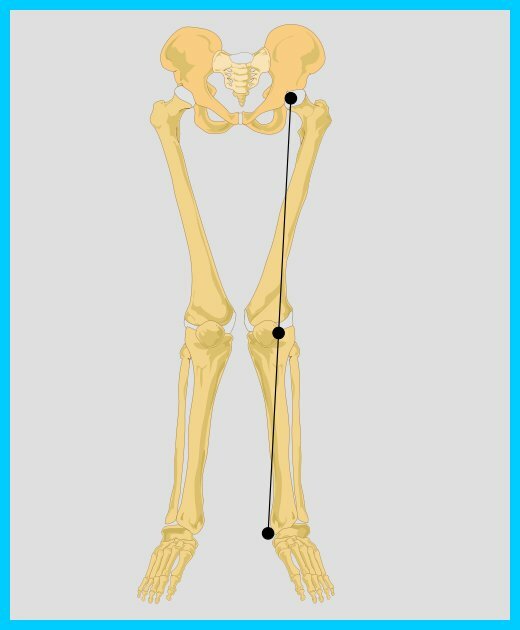 The Q angle which is formed by a line drawn from the anterosuperior iliac spine through the center of the patella and a line drawn from the center of the patella to the center of the tibial tubercle, should be measured next. In women, the Q angle should be less than 22 degrees with the knee in extension and less than 9 degrees with the knee in 90 degrees of flexion. In men, the Q angle should be less than 18 degrees with the knee in extension and less than 8 degrees with the knee in 90 degrees of flexion. Degree of deformity, muscle chart and ROM are measured. In mild cases of Genu Valgum in young children, wearing of boots with the inner side of heel raised by 3/8" inch and elongated forward heel (Robert Jones heels) corrects the deformity. In more complicated cases, the child requires a supracondyles closed wedge osteotomy. Gradual knee mobilization is the main part of the treatment. Some heat modalities may be given for relief of pain. Strengthening exercises for quadriceps, hamstrings and gluteus muscles are given. When the patient is able to walk, he is given correct training for standing, balancing, weight transferring and walking.